A unique group drumming class for adults that combines West African and Brazilian-based rhythms and instruments. 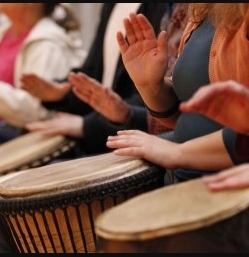 This class is for players of any level of musical and drumming background – including novices – in mind and its aim is to allow people to experience the sheer joy that playing rhythms from these parts of the world evokes! – People who’ve just always wanted to try drumming – which just about covers everyone! Professional development credit is available by request. *Instruments will be provided but you may also bring your own djembes, dununs, or Brazilian bateria.